These popular appliances are made by a number of different manufacturers, and some have advanced features and multi-cooking capabilities. Slow cooker, crockpot, crock pot, and Crock-Pot are perhaps the most common terms we see when searching for recipes. 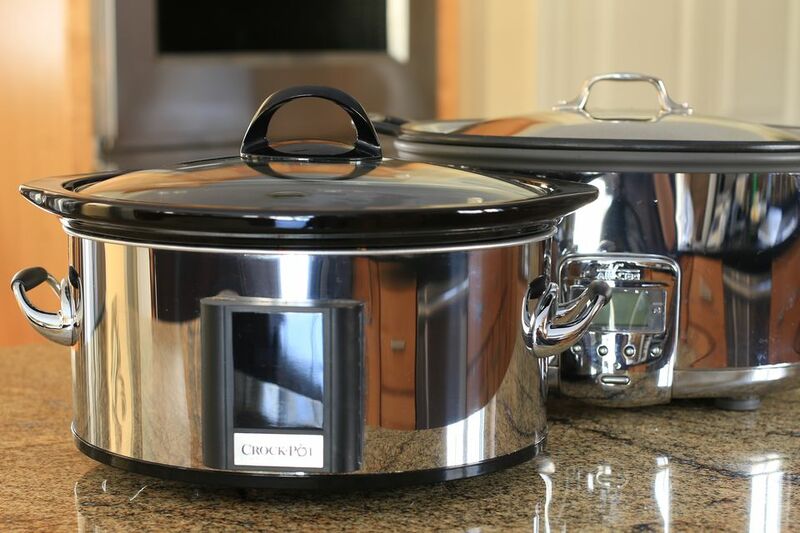 The most common slow cooker models have a crockery pot insert, and the heating elements are housed in the sides and bottom, so the heat surrounds the food. The two heat settings are LOW and HIGH, and many have a WARM setting these days. Timers are found on many cookers as well, and some automatically switch to the WARM setting when the food is cooked. Some have a metal insert which can be used on the stovetop to sear meats or begin the heating process. Other types of slow cookers and multi cookers heat only from the bottom of the pot. These cookers might even have a thermostat allowing a wide range of temperatures. Recipes cooked in this type of cooker might need occasional stirring. And if you do lift the lid to stir, you should add about 15 to 20 minutes to the cooking time. So the difference lies not in the name or brand, but in the way, the heat is distributed under or around the crockery (or metal) insert. The term Crock-Pot® was actually Rival Manufacturing Company's trademarked name, and it is now owned by Sunbeam, a division of Jarden Corporation. The Rival Company introduced the Crock-Pot name in 1971. Because the term Crock-Pot is a registered trademark, most manufacturers use the term "slow cooker." Other brands of slow cookers include All-Clad, Cuisinart, GE, West Bend, Hamilton Beach, Breville, and others. Many of the recipes you find online were designed or created with the older Rival models in mind. Become familiar with your brand of slow cooker and the cooking times for specific recipes in the user's manual. While an older recipe might call for a roast to cook from 10 to 12 hours on the LOW setting, a newer appliance might call for 8 hours. Safety considerations might be updated as well. There are many multi cookers on the market that claim slow cooker capabilities, including cookers that can double as pressure cookers, rice cookers, and most are capable of searing and sauteeing the food.